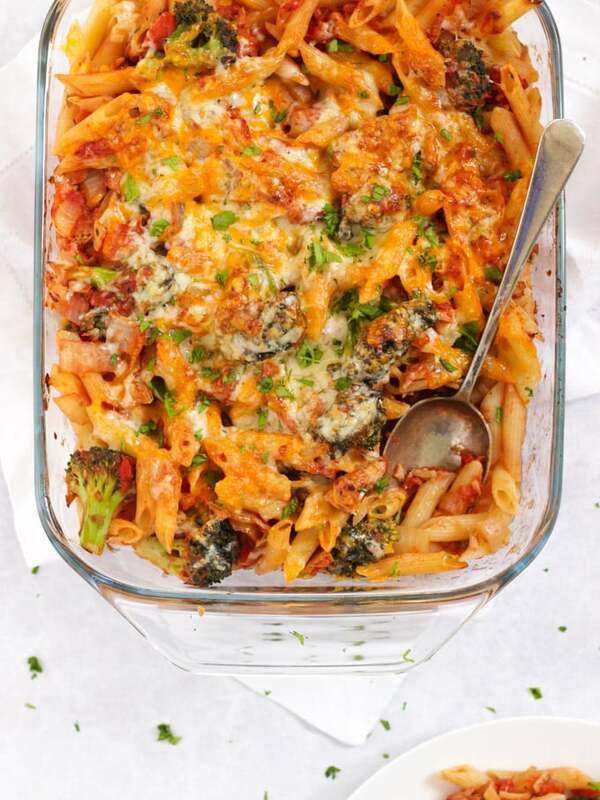 This healthy Tuna Pasta Bake recipe, is made with a quick homemade tomato sauce and cheesy top for an easy comfort food dinner that everyone will love. Meals in my house growing up were homely, warming, but definitely pretty traditional. There were lamb chops, casseroles and the odd steak. Until, sometime about 1990, when my lovely Mum discovered pasta. She’d seen someone using it on TV and we needed to get with the times and try it. From then on, Cheesy Tuna Pasta Bake was a regular staple dinner in our house. It was new found sophistication, don’t you know. This recipe takes me right back to growing up, meal times in that steamy kitchen. My recipe for this pasta bake has hardly changed since then and George and Harriet love it just as much as I did then. After I asked you on Instagram a few weeks ago what type of recipes you’d like to see, heaps of you said pasta recipes. Honestly, I often forget to share them as they are my regular, back up, store cupboard recipes. So, I guess they feel a bit unexciting to share here? But sometimes, the simplest things are the best though aren’t they? 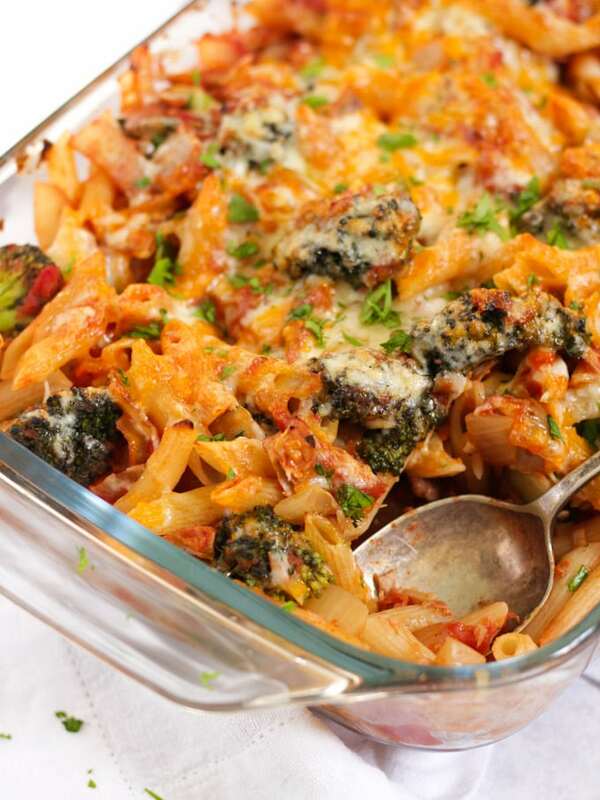 So, here you have it, our ever popular in this household Tuna and Broccoli Pasta Bake! Start by cooking your pasta in boiling, salted water. A few minutes before it’s done, add in your broccoli florets. Meanwhile, fry off your onion and garlic to soften, before adding in your tinned tomatoes, tomato puree, oregano and salt and pepper to make a simple and healthy tomato sauce. 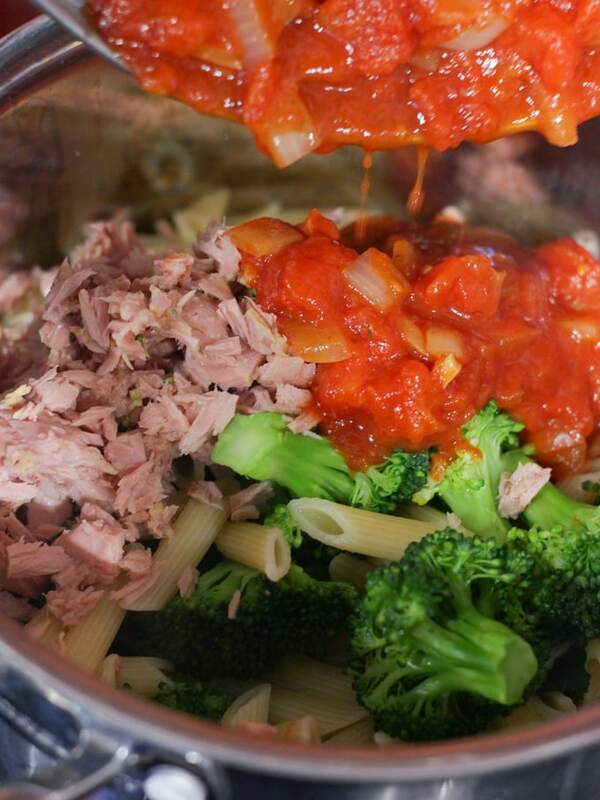 Drain your cooked pasta and broccoli, add in the tuna and your tomato sauce and give everything a good mix. Pop into a dish and top with grated cheese. 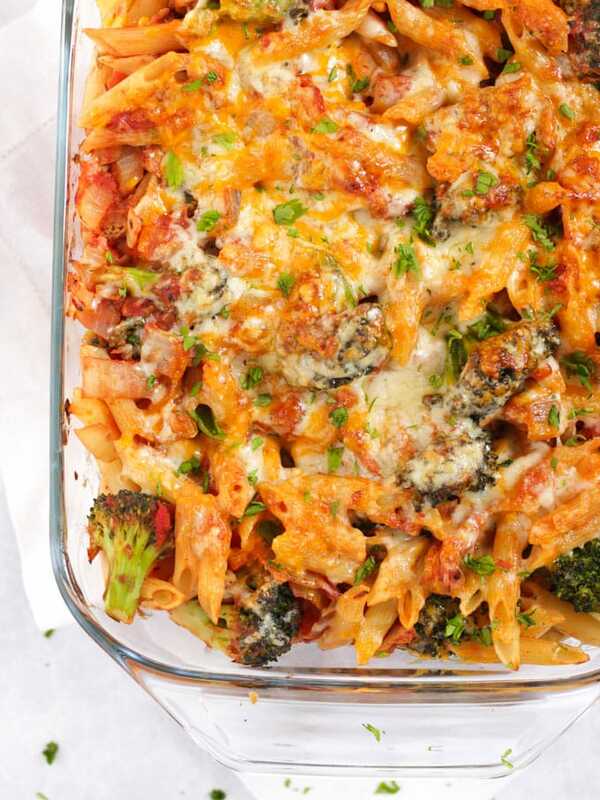 If you’re making this pasta bake and serving straight away, just pop under the grill to melt the cheese. The pasta and sauce will already be hot and it will be quicker than heating up the whole oven. OR if you want to prep this in advance (which I often do), bake it in the oven (180C for about 20 minutes) to heat through and melt the cheese on top. I’ve used a mixture of Cheddar and Red Leicester cheeses here grated. You can use whichever cheese you have to hand. The Red Leicester gives colour, which I like, but I probably wouldn’t buy it especially for the recipe. You could also use Mozzarella if you like the stretchy cheese effect. Can you reheat this recipe? You can reheat Tuna Pasta Bake. Just warm it through in a microwave until it’s piping hot. You can freeze this Tuna Pasta Bake recipe, but honestly, I’m never a huge fan of defrosted pasta. If you do want to freeze it, just undercook the pasta everso slightly (by 2 or 3 minutes) when you’re boiling it, so it doesn’t overcook when you defrost/reheat it. Allow it to thaw fully and then heat through before serving. There are lots of ‘Creamy Tuna Pasta Bake’ recipes around, but in mine, I’ve always used a tomato sauce. 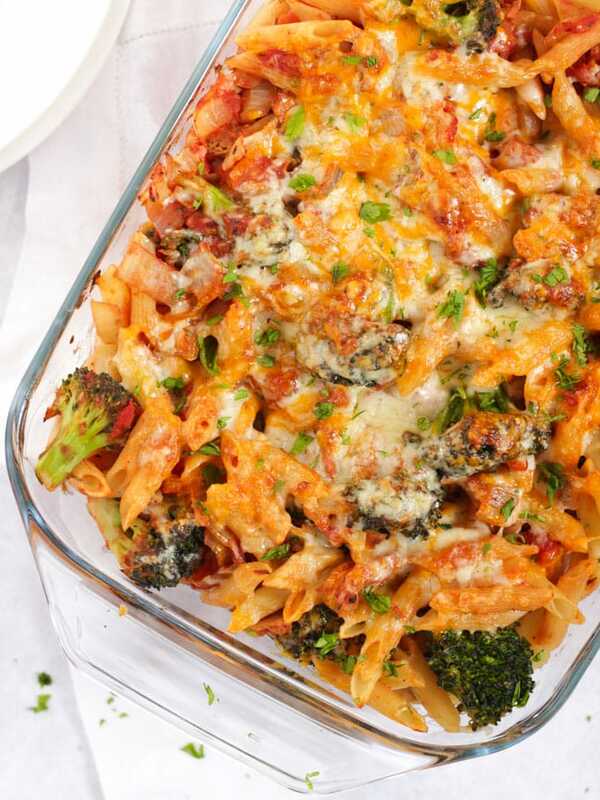 I prefer this tuna pasta bake tomato sauce as it’s a little lighter and with added broccoli too it makes it a one pan meal with about 2 of your 5 a day. If you do want to make the dish more creamy, add in 100g of Cream Cheese or Creme Fraiche to the tomato sauce at the very end of cooking when you add it to the pasta. This keeps it light, but adds that creamy sauce texture. This can be easily adapted to be Slimming World friendly, if you’re following that plan. Just use Frylight spray instead of oil and count the cheese as your Healthy Extra allowance or count the Syns. Simple and Syn free! 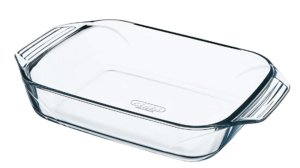 THIS roasting dish which I use all the time and is also great value. Tuna Pasta Bake with Crisps – I know. RETRO! But one of my friends swears by this! Crumble of a bag of smashed crisps with your cheese for added texture! Tuna Bake without Pasta – In place of pasta, you could use boiled and cubed potatoes for a different Tuna recipe. 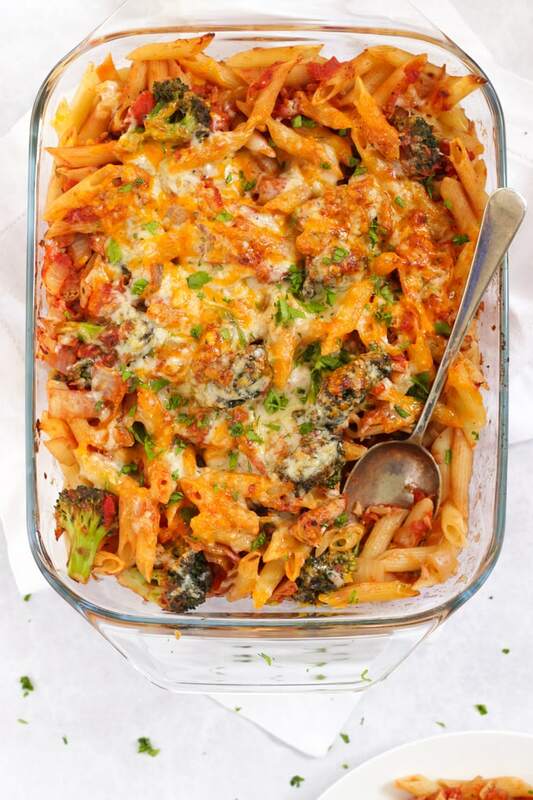 Spicy Tuna Pasta Bake – Add 1 tsp of dried chilli flakes (or more if you dare!) to the tomato sauce as it cooks to make a Spicy Tuna Pasta Bake. Breadcrumbs – Add 4 tbsp of breadcrumbs when you sprinkle your cheese on for added CRUNCH! Creamy Tuna Pasta – If you want a more Creamy Tuna Pasta, add in 100g of Cream Cheese or Creme Fraiche to the tomato sauce at the very end of cooking when you add it to the pasta. 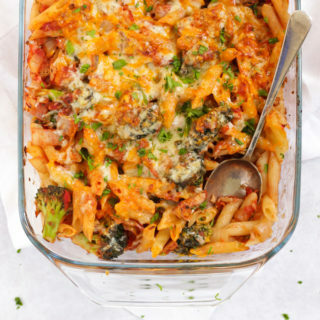 Tuna Pasta Bake without Cheese – feel free to omit the cheese off of the top if you prefer, you could just add a few tablespoons of breadcrumbs instead. 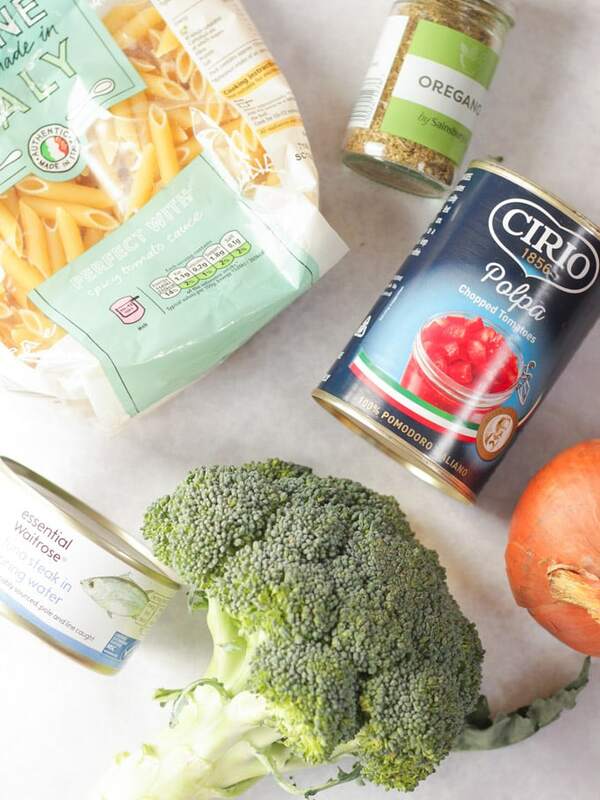 Higher fibre – Replace the same quantity of pasta with wholemeal pasta to up the fibre content. Hope you enjoy this recipe as much as we do. I’d love to know how you got on and what you thought of it if you make this. Please rate the recipe and leave me a comment below if you do. Cook the pasta according to pack instructions, add the broccoli into the boiling water with the pasta about 4 minutes before the end of it's cooking time. Meanwhile, heat the oil in another large pan. 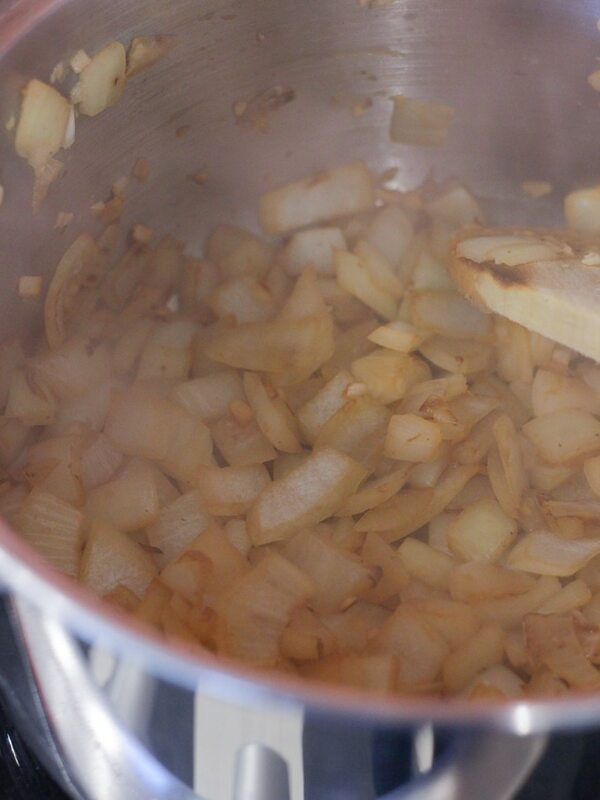 Add the garlic and onions and soften for 4 - 5 minutes. Add the tinned tomatoes, tomato puree (if using), oregano and salt and pepper. Give it a good stir and let it bubble and thicken for about 10 minutes. Meanwhile, drain the pasta and broccoli (they should be done by now). Now mix the drained pasta, tomato sauce, and drained tuna until well combined. Pop into a shallow dish and sprinkle with the cheese. Pop under the hot grill (or oven - see notes) to melt and bubble the cheese. 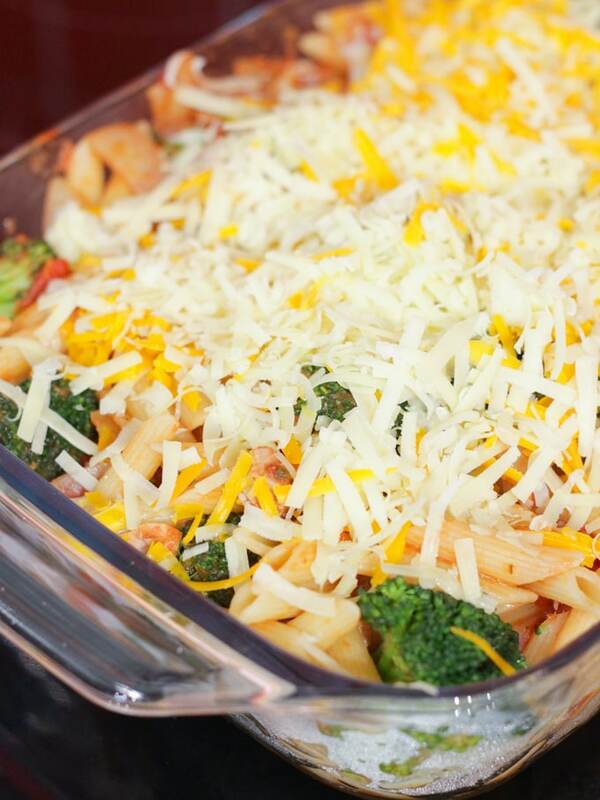 If you're making this pasta bake and serving straight away, just pop under the grill to melt the cheese. The pasta and sauce will already be hot and it will be quicker than heating up the whole oven.